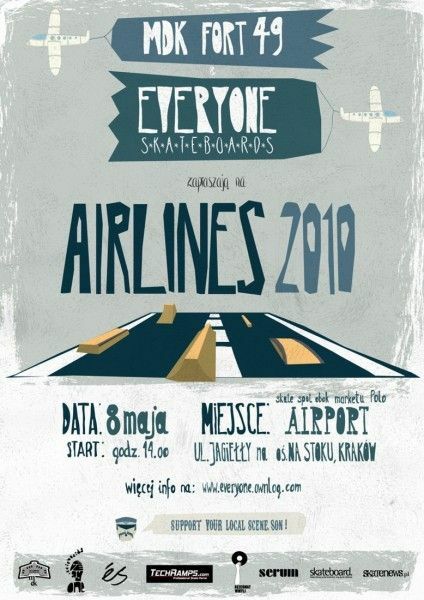 Airlines 2010 - News - Skateramper - Skatepark bygging. Konstruksjon og design av skateparker skateanlegg i betong. World Snowboard Day 2014 - Białka Tatrzańska - video. Skatepark in Wąchock it's finally open. Techramps on Wood Camp T1 2014. Skatepark in Olkusz - opening. 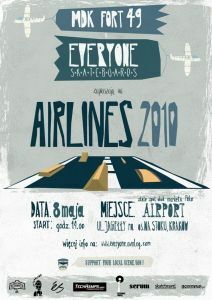 Everyone Airlines captain and his crew MDK 49 Fort invite all the high and long flight Skateboarding 8th May in Krakow, start 14.00. During several hours in the form of spectacles best line and best trick skate spot popularly known as "Airport" on the axle. On the slope in Nowa Huta best pilots will present bone-chilling air acrobatics. The runway will be prepared by Techramps and about communication with air traffic control tower will ensure Reservation vinyl with Serum. However, eS, will ensure that the landing was soft and comfortable. Book'ujcie time now. More info at everyone.ownlog.com. Thank you and wish you a pleasant flight. współrzędne na mapie 50.096166, 20.050386.